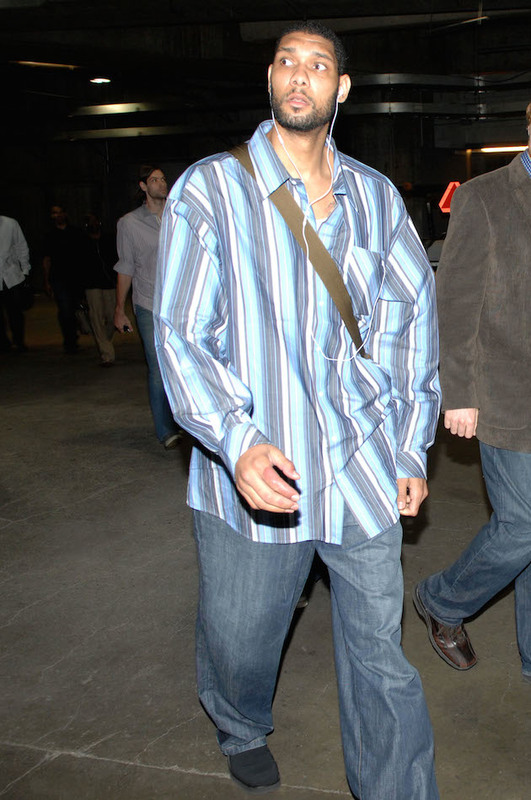 Sure, Tim Duncan was a really great basketball player, but he was also an astoundingly terrible dresser. Now that he’s announced his retirement, much will be written about his legendary career. He certainly deserves those fond remembrances, but he also deserves to be roasted for his terrible fashion choices. Let’s take a look at his worst crimes of style. Sweatpants and hoodies are as much a part of Duncan’s legacy as the mid-range jumper. After winning his second straight MVP award, Duncan made a much better fashion choice than after the first one (more on that later). Sure, it’s pretty drab, but at least everything fits reasonably well. Do you think his collar is big enough? Your eye immediately goes to garishly patterned shirt, but don’t sleep on the jeans. Are those supposed to be short sleeves? Timmy was clearly thrilled to win his first big award, so he broke out his finest undershirt. I’m not even mad. I’m just impressed a guy with a 7'6" wingspan was able to find a garment with sleeves that are eight inches too long. No one looks good here. The 2000s were a dark time. NBA Trivia: Tim Duncan bought a pair of jeans with his first pro paycheck and never bought another pair. Jorts and Birkenstocks. Most NBA players wouldn’t show their face in public after that. Duncan went out and won the MVP again the next year.